Actiontec GT784WN DSL Modem Router Review - Best Review by Dan Karas. 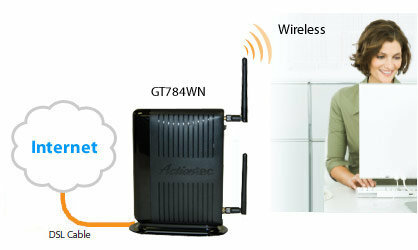 The Actiontec GT784WN is a new full featured, high performance combination ADSL modem and wireless N router from Actiontec. The GT784WN and the Actiontec wireless G model GT724WGR are two of the highest consumer reviewed DSL combo modem / routers you can buy at Amazon. This device is compatible with virtually all major DSL service providers including At&t, Verizon, Qwest, Frontier, Centurylink, and most other DSL Internet services. Setup is simple due to the auto-detection of specific DSL provider service settings. This enables non-technical users to setup the GT784WN with relitive ease. Another cool feature is the MIMO Smart Antenna. This helps to improve your wireless performance and extend the range of your wireless signal while getting rid of dead or weak spots in your wireless coverage area. Convenient Combination ADSL2+ Modem & Wireless N Router. 802.11n Wireless-N Router Provides Outstanding 300 Mbps Speed & Performance. Automatic Configuration - Actiontec's AutoDetect Wizard Makes Set-Up A Breeze. Includes Wireless Security, High-Grade Firewall, Parental Controls. Customer Support - Actiontec provides 24/7 support, over the phone or online. The Actiontec GT784WN ADSL2+ combo Wireless-N Router is not the cheapest you can buy, but if you compare features and performance the GT784WN is a great value. The speed, performance, features, and Excellent Customer Reviews of the GT784WN make it a serious contender if you're in the market for a quality DSL modem/router for your home or office. In my opinion the Actiontec GT784WN is a full-featured, quality product and deserves five stars. PDF Format - "Actiontec GT784WN DSL Modem Router Review"